Today in Masonic History Chauncey Fitch Cleveland is born in 1799. Chauncey Fitch Cleveland was an American politician. Cleveland was born on February 16th, 1799 in Canterbury, Connecticut. Growing up he attended the common schools, now referred to as public schools.. He started teaching at the age of fifteen, until the age of twenty. During the time he was teaching he was also studying the law and in 1819 passed the bar and opened up a law practice in Hampton, Connecticut. Cleveland began his political career in 1826 when he was first elected to the Connecticut House of Representatives. He served 8 non-consecutive years between 1826 and 1848. This included 1826 to 1829, 1832, 1835, 1836, 1838, 1847 and 1848. In 1836 and 1838 he served as the Speaker of the House. He would return to the House of Representatives in 1863 and 1866. 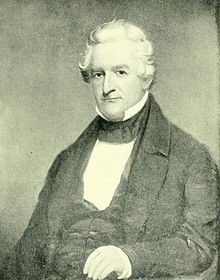 It was during the period from 1826 to 1848 that Cleveland served as the Connecticut State's Attorney (1832) and the State bank commissioner (1838). In 1842 Cleveland was elected as the Governor of Connecticut serving two terms until 1844. In 1848, Cleveland was elected for the first time to the United States House of Representatives. He served two terms in the House until 1853. In 1854 the Republican Party was founded by anti-slavery advocates, ex-Whigs, ex-Free-soliers and modernists. Cleveland was an early supporter of the party and was present at the 1856 and 1860 national conventions. In the lead up to the American Civil War, Cleveland was part of a Peace Congress that was held in Washington, D.C. The purpose was to find alternative solutions to the Civil War before it started. In 1867, Cleveland returned from public life. He engaged in agricultural pursuits and practicing the law until the time of his passing on June 6th, 1887. Cleveland was a member of Eastern Star Lodge No. 44 in Windham, Connecticut. He was initiated into the lodge in 1821 and served as the lodge's Junior Warden.